For over the past year, I’ve been running pretty regularly, something I’ve equated over the years to boring and likely to result in an injury since I had double Achilles tendon surgery as a 7yo kid. But then my son had a similar surgery last summer (much less invasive) and I started to run for him – and for me. Since then I’ve lost 20lbs, back to the weight I was as a Sophomore in Undergrad and I credit running and a good tools including SparkPeople.com and tracking my progress using tools like Nike+ and RunKeeper for keeping me motivated. I’m not doing marathons, but a few 5K intervals with elliptical help keep me fit(ter) and I’ve shaved from a 10:45’ mile to a 9:14’ average. But I’ve burned through two Nike+ Foot Pods and am on my 3rd set of Mizuno running shoes, and found a Garmin Forerunner 305 too much and lacking in different areas, this hobby is starting to get expensive. I moved to Runkeeper due to the better accuracy of the GPS for tracking my movement and not needing to calibrate the way the foot pod requires. Enter Nike+ GPS, a much needed improvement to Nike’s solution. The new version uses the accelerometer in your phone, calibrating to your movements. I have yet to try it but over the next few days I’ll give it a workout on the open road and treadmill, schedule permitting. Download it on the go and start running anywhere. With this app in hand, track every indoor and outdoor workout easily, without a sensor. Record your pace, distance and run route using the iPhone’s GPS and accelerometer technology so you can focus on the road ahead, and relive your run later. Anytime you’re up for a challenge, push farther, faster, or longer to better reach your goals. Then celebrate your victories with fun, motivational messages from Nike’s top athletes. As you run, get voice feedback on how you’re doing or tap the map to see where you are. Then activate your personalized PowerSong for an extra boost. Quickly send each run to Nikeplus.com where you can brag to friends, join challenges, set goals and connect with the rest of the Nike+ community. 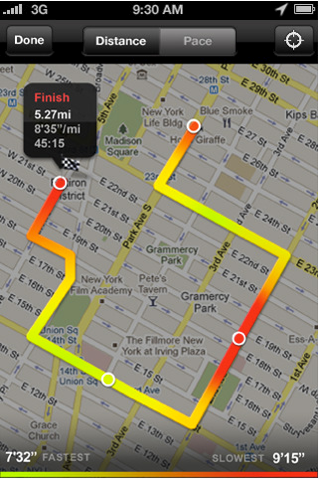 The Nike+ GPS app was designed for the iPhone, but it’s also compatible with the iPod touch (without the mapping capabilities). Did I miss a mention of this in Steve’s keynote last week? Nike+ GPS recorded longer distances than my actual route. I have a feeling it used the accelerometer instead of GPS. Does Nike+ GPS use the accelerometer or GPS? I’ve tried Run Keeper and Logyourrun. They too recorder longer distances than the actual. But Nike+ was off by a large distance. 4.1km for an actual 2.8km! You can imagine that my pace was very optimistic and tiring! Is there a way to calibrate the app? Or turn of accelerometer?